Like all of you, I SO enjoy making cards. I especially love digging in to my stash and using older supplies as I did for these three cards today. But to be perfectly honest, my cards are always SO much better with ribbons and trims; and Really Reasonable Ribbon has the PERFECT ribbons and trims for every project. All three of these cards use lots of cute October Afternoon patterned papers, stickers, etc., but each card was "made even better" with some of my favorite trims and Embellishments from Really Reasonable Ribbon. My first card uses a length of Pink Center Stitch Burlap, and Teal Baker's Twine. It's easy to see how these two fun trims really give this card great dimension and just add SO much to a really simple design. Really Reasonable Ribbon carries 44 styles/colors of Baker's Twine, and at just ten cents ($0.10/yd. ), it's a very inexpensive trim with SO many possibilities. You're sure to find the perfect color for your next project. 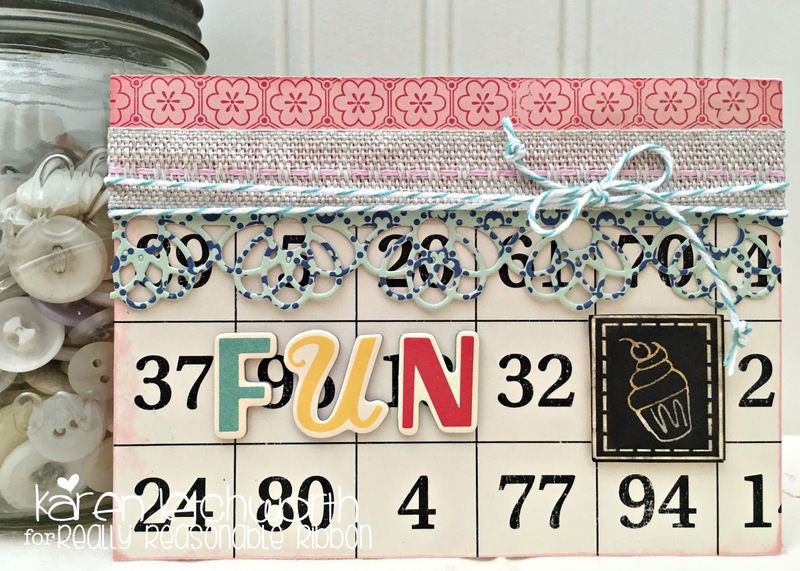 My second card (above) uses three patterned papers, a rubber charm, and half of a Cherry Lynn Designs doily die-cut. This card was decorated, again using just two Really Reasonable Ribbon trims. 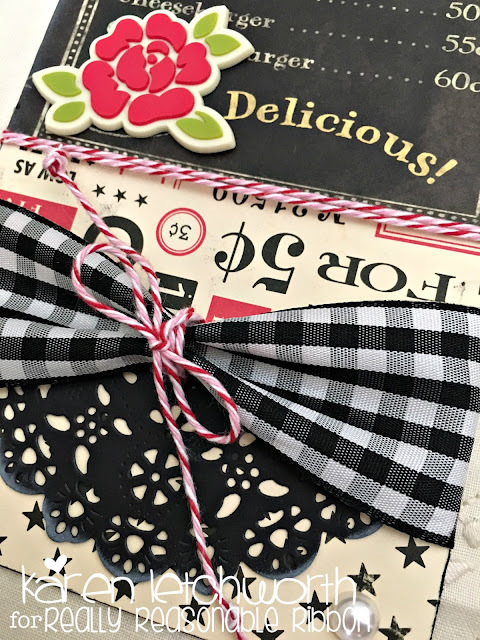 I used a length of 1.5" Black Gingham Ribbon and some Peppermint Baker's Twine. 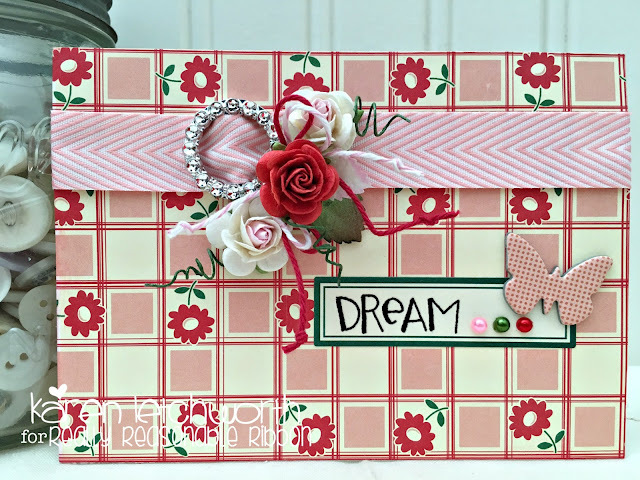 This ADORABLE Peppermint Baker's Twine combines the colors white, pink and red. 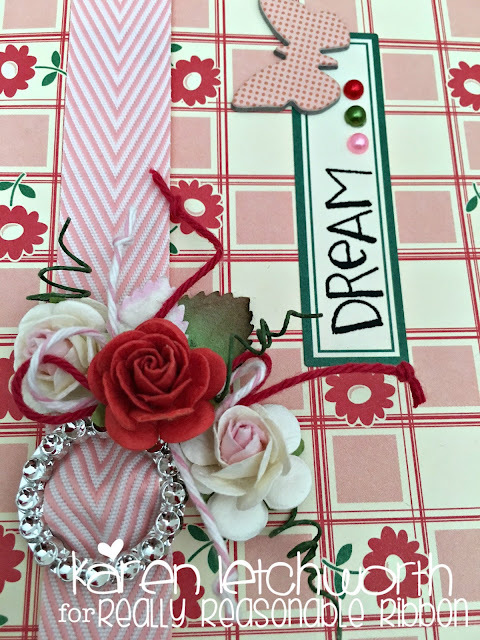 It's SO cute, and is a great trim for Valentine's Day, Christmas, or as with this card...just about any time. I also added a White Flatback Pearl to the bottom of my card. These sweet White Flatback Pearls come in FIVE sizes, and are such a cute little accent. 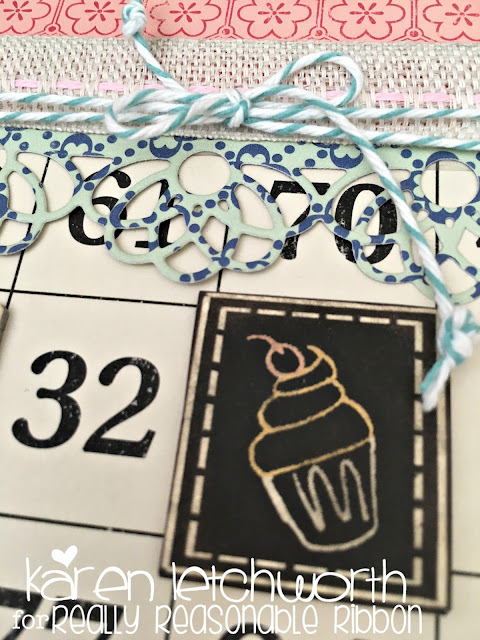 The last card I'm sharing today uses just one patterned paper. 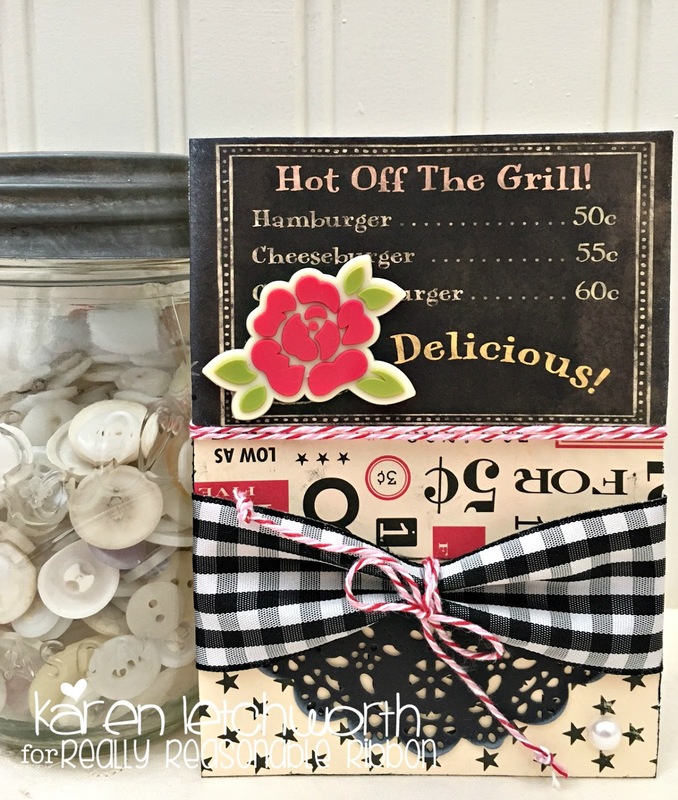 Look how much pizzazz this sweet trim I ran across my card adds to its overall design. It's our 3/4 Pink Chevron Striped Twill and this fun trim comes in 11 different colors (in this width). Yup, Really Reasonable Ribbon truly has it all!! This third card has a Blingy Metal Rhinestone Ribbon Slide on the 3/4 Pink Chevron Striped Twill. I also added a little bow with Red Solid Bakers Twine and Cotton Candy Baker's Twine. I topped that with some Red Open End Roses and Two-Toned Ivory and Pink Open End Roses, a 35mm Green Leaf and a 30mm Two-Toned Leaf. Lots of great "Spring Blooms" on this card. Before I run off, I want to remind you that there's a FUN CHALLENGE at Really Reasonable Ribbon, as well as LOTS of great inspiration every day on the RRR Blog, and SO many amazing products in the Really Reasonable Ribbon Store. You won't want to miss a thing. Thanks for stopping by! Really Reasonable Ribbon Challenge #161 Winners! Really Reasonable Ribbon April Blog Hop Winner! Really Reasonable Ribbon Challenge #160 Winners!